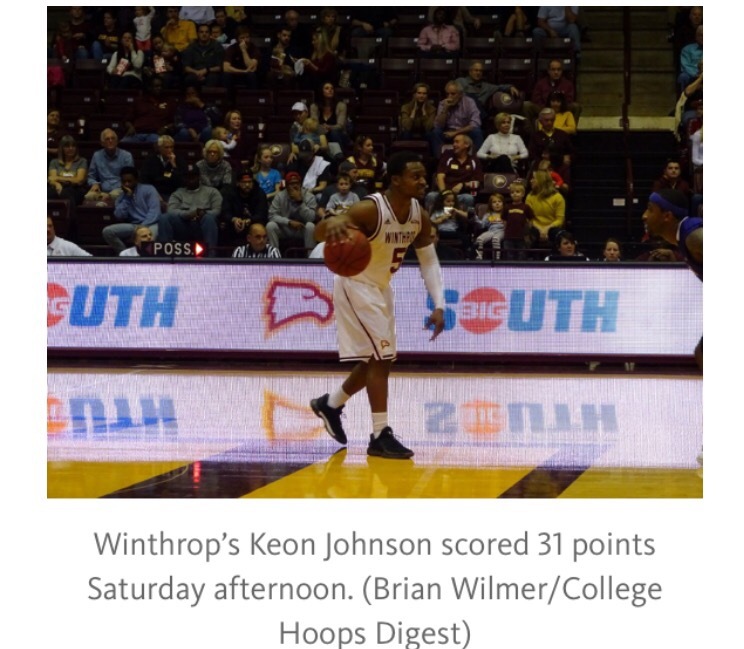 ROCK HILL, S.C. — In a four-year Winthrop career in which he has hit some of the biggest shots in his school’s history, Keon Johnson almost walked away with one of his most memorable Saturday afternoon.Almost. Johnson’s contested 25-footer from the right wing inexplicably dropped, just as the 2,255 fans who went crazy in the Winthrop Coliseum had seen so many times from the senior. The excitement was short-lived, though, as a time out had been called just a breath before the shot was launched. The ensuing possession ended with a shot that fell short, allowing High Point to escape with an 83–80, overtime victory. Kelsey’s reaction probably echoed that of the fans in the seats when they realized the shot had been waved off. The overtime period came after a second straight game in which a large lead slipped away from the Eagles. A Johnson free throw gave his club a 38–24 lead with 3:10 to play in the first half, before High Point closed the half on a 9–0 run to slice the halftime margin to five. The burst continued into the second twenty, as the spurt eventually reached 20–2 and gave the visitors a four-point lead. High Point (12–10, 6–4 Big South) never saw its lead grow larger from there, as Winthrop (16–5, 8–2) countered with an 11–1 response that stretched its lead back to seven. High Point quickly countered, however, seemingly matching Winthrop basket for basket for several minutes. Winthrop extended its lead to six on a number of occasions, but could pull away no further, as the visiting Panthers calmly kept themselves alive. High Point’s Tarique Thompson made a bucket in the lane to tie the contest at 75 with 28 seconds remaining, and Johnson was nearly poised to become the hero before overtime ever became necessary. Johnson drove the lane, but his final attempt was blocked away by High Point forward Miles Bowman Jr., as both players crashed to the floor. Johnson finally arose from the deck after a few minutes, but Bowman Jr. was helped off the floor, unable to place any weight on his right foot. The redshirt senior would not return to the game. Fox scored 10 on the day, one of four Panthers in double figures. Bowman led his club with a double-double, scoring 22 points and hauling in 10 boards. Thompson added 17, with Anthony Lindauer tallying 15. Johnson’s 31 led Winthrop and all scorers. Junior forward Xavier Cooks contributed 19 points, eight boards, five blocks and three assists, guiding his club for several key stretches before Johnson took over. Senior forward Tevin Prescott added 10, going 5-for-9 from the floor. The decision marked High Point’s fifth straight victory, as the Panthers continue through a stretch that drew them praise from Cherry for how the club has responded after a 1–4 opening to the league slate. Perhaps the biggest praise Cherry offered all day came toward someone not wearing purple on Saturday, however. Both teams will hit the road to Virginia for Big South action on Wednesday. High Point travels to Longwood, while Winthrop visits Radford. Both games are slated to begin at 7:00 (Eastern). HIGH POINT (12–10, 6–4 BIG SOUTH): White 2–6 1–1 5, Wright 1–4 2–4 5, Fox 5–8 0–0 10, Madison 4–8 1–1 9, Bowman Jr 7–13 2–2 22, Williams 0–1 0–0 0, Thompson 7–15 3–3 17, Vargo 0–1 0–0 0, Lindauer 6–12 0–0 15. Totals 32–68 9–11 83. WINTHROP (16–5, 8–2): Okeke 0–0 1–2 1, Perkins 1–4 1–3 4, Johnson 11–18 4–4 31, Cooks 7–17 4–5 19, B. Broman 0–3 4–4 4, A. Broman 0–1 3–3 3, Pickett 1–2 2–2 4, Ferguson 0–0 2–2 2, Prescott 5–9 0–2 10, Davenport 1–3 0–0 2. Totals 26–57 21–27 80. Halftime — Winthrop 38–33. 3-Point Goals — High Point 10–21 (Wright 1–2, Fox 0–2, Madison 0–1, Bowman Jr 6–7, Thompson 0–1, Vargo 0–1, Lindauer 3–7), Winthrop 7–16 (Perkins 1–3, Johnson 5–7, Cooks 1–2, B. Broman 0–3, A. Broman 0–1). Fouled Out — None. Rebounds — High Point 36 (Bowman Jr 10), Winthrop 33 (Cooks 8). Assists — High Point 13 (Wright 7), Winthrop 8 (Cooks 3). Total Fouls — High Point 17, Winthrop 16. Technical — None. A — 2255. Points in the Paint — High Point 30, Winthrop 26. Points off Turnovers — High Point 12, Winthrop 8. Second-Chance Points — High Point 7, Winthrop 6. Fast Break Points — High Point 4, Winthrop 2. Bench Points — High Point 32, Winthrop 21.